Artificial sweeteners have been hailed at the great solution to replace sugar, however more and more information is coming to light that these alternatives are unsafe and some are even worse than sugar. But what if there was an naturally sweet herb that has been used safely for decades in other areas of the world that could replace sugar? Well there is and it has finally started to catch fire in the U.S. It’s called Stevia. Stevia rebaudiana, is derived from a plant in the chrysanthemum family grown primarily in South America and Asia. It’s sweetening qualities are complex molecules called steviosides. They are glycosides and make stevia up to 300 times sweeter than sugar. These glycosides don’t get absorbed into the body, they just pass through leaving no calories. All Stevia products are not the same. I have been investigating various Stevia products and have found some very important facts that you should be aware of regarding Stevia – mostly that many of the Stevia products on the market are heavily processed and contain other ingredients than just stevia. For example: Stevia in the Raw is mostly Maltodextrin. You may have never have heard of this food ingredient before, or you may have heard a lot. Either way, you most likely have ingested it many times throughout your life. Pick up 5 things in your kitchen with a label and read the ingredients list. Chances are a couple of those labels have maltodextrin in them. You’ll often find it in salad dressings, frozen yogurt, spice mixes, Cheetos, candy, baked goods, fat-free and sugar free products. You’ll even find it in meats, nutrition bars and many meal replacement shakes like Ensure and Advocare. There’s been a lot of hype about MSG, high fructose corn syrup, and hydrogenated oils, but maltodextrin is found in even more foods, yet is still fairly under the radar. 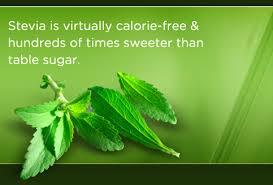 Truvía is another stevia-based sugar substitute developed jointly by The Coca-Cola Company and Cargill. It is distributed and marketed by Cargill as a tabletop sweetener as well as a food ingredient. Truvía is made of rebiana, erythritol, and natural flavors. Because it comes from the stevia plant, Cargill classifies it as a natural sweetener. Since its launch in 2008, Truvía has become the second best-selling sugar substitute in the United States. Truvía’s ingredients are erythritol (a sugar alcohol found naturally in small amounts in various fruits such as grapes and melons), stevia leaf extract and natural flavorings. Erythritol is a naturally-occurring substance found in many fruits; however since it is present in such small amounts (less than .005% by weight) it is impractical to produce erythritol commercially simply by obtaining it through natural sources. Cargill manufactures Truvia’s erythritol by processing corn into a food grade starch which is then fermented with yeast to create glucose and then processed further to create erythritol. Whoa! Get actual organic raw Stevia leaf. You can order it from Raw Life Inc. – see link below. Ingredients: 100% pure stevia leaves. No binders, fillers or additives are used. This product is non-irradiated and non-fumigated.